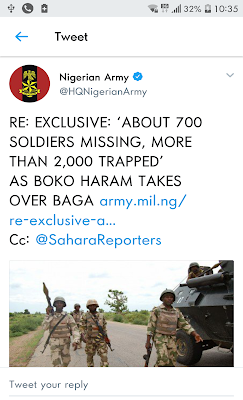 Our attention has been drawn to a news story with the headline “EXCLUSIVE: ‘About 700 Soldiers Missing, More Than 2,000 Trapped’ As Boko Haram Takes Over Baga” on Sahara Reporters website alleging that such number of soldiers were trapped and the Nigerian Air Force (NAF) could not do anything to extricate them. This is not only untrue but a deliberate mischief on the part of the medium to create erroneous impression about the military and the concerted effort of the ongoing clearing and mop up operations in the general area. Therefore, no one could give accurate details of the encounter yet, as the troops have been reinforced and are busy with pursuit and mopping up operations against the terrorists. Consequently, Sahara Reporters is advised to be more responsible in its reportage and always cross check its facts before posting it on its website. The medium’s position is understandable because the reality on the ground does tally with an earlier scripted or expected narrative handed out by Boko Haram terrorists and their sympathizers as was the case in previous instance. We wish to reiterate that we shall keep the public informed of true position of things in the Theatre.